Care Ambassadors invest in clinical care excellence by supporting the Institute for Nursing and Interprofessional Research (INIR). 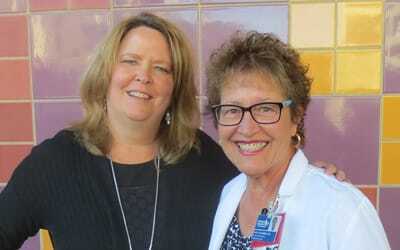 The INIR gives nurses and patient care experts at CHLA the structure and mentorship needed to expand their roles beyond the bedside and conduct research that will transform pediatric health care. Care Ambassadors direct their contributions to the INIR Innovation Fund to provide essential seed funding for the infrastructure of this groundbreaking program and the very first grant awards for important research projects. With a close connection to the program, Care Ambassadors can experience tremendous satisfaction from seeing their collective gifts make immediate improvements in patients’ lives. Led by volunteer co-chairs, Kathy Hauck, a grateful patient parent and Phyllis D’Ambra, a 40-year veteran nurse at CHLA, the Care Ambassadors Leadership Council is rallying a wide range of support from a diverse community of friends – community members, patient families, current and retired CHLA staff and more. Volunteer council leaders give or raise generous gifts annually and organize outreach activities.